When is a toy not actually a toy? When it is an actual steam engine in full working order, powered by its own boiler. 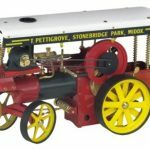 This is the 1313 Steam traction engine from Mamod (model number TE1a Green), a replica model of a Victorian era English tractor engine that comes in black, with a British racing green boiler, and cheerful red wheels. There is also a version in brass with black wheels. This engine is modelled on the traction engines made by the iconic Doncaster Works, which also produced the famous Mallard and Flying Scotsman steam engines. Traction engines powered their way along the roads, such as they were in the late 1800s, earning them the name of road locomotives, to differentiate them from railway locomotives. They pulled heavy loads and were a crucial cog in the industrialisation of nations. Their demise came in the early 20th century as the internal combustion engine replaced steam. The 1313 is Mamod’s standard model traction engine in its range. 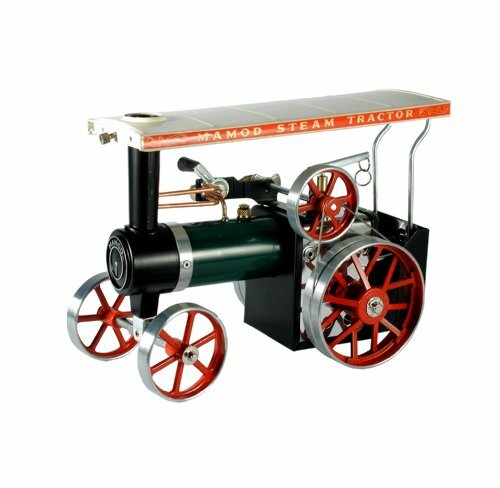 It’s hugely popular and for good reason – this working model is affordable and perfect for beginner collectors, or as a gift to a youngster keen on Victorian engineering. It’s been made by Mamod in England for 50 years now, using the exact same design, although early models used methylated spirits for fuel. It isn’t unusual for owners to still have, and use, engines that had been brought 30, 40 or 50 years ago. These have become almost heirloom toys, with parents handing them down to their children, who also pass them on. The Steam traction engine comes fully assembled and ready to go. 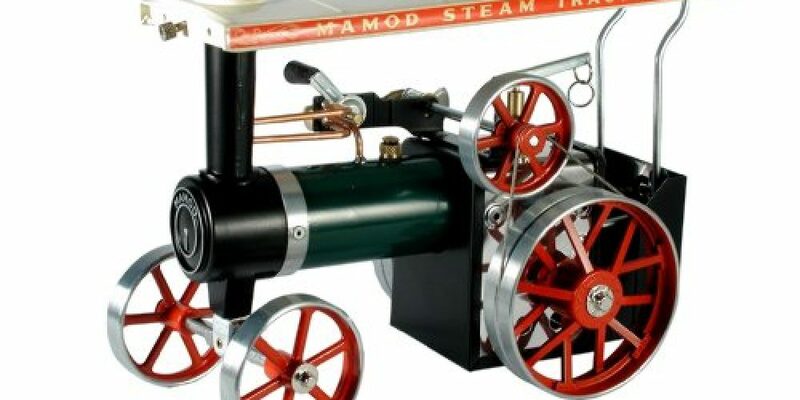 Because it gets very hot, and has lots of sharp bits, not to mention the potential dangers of the steam and boiler, this toy is recommended for children aged 14 years and upwards. The boiler is stoked through the solid fuel blocks provided with the engine, and once it gets sufficiently hot, the little engine will power along quite quickly. It also comes with Mamod oil for lubrication. You only need to add water to the boiler. However, you really need to put water in that is already boiling. Otherwise, you’re in for a bit of a wait for the steam to get up. 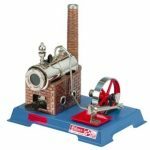 The engine is really robust, being made of heavy gauge steel and brass and a reasonable size at 10 inches long. For the metric minded, its full dimensions are 178mm x 137mm x 270mm. It’s also reasonably hefty at four pounds, or 200 grammes, but not as weighty as you might expect from such a little powerhouse. This is simply a fun toy to play with. There is a sense of excitement from the steam coupled with the smell of the fuel burning, and the power of the traction engine as it moves along. It is also educational, helping youngsters understand the power and engineering of the great steam engines of our past.